Yanbu Aramco Sinopec Refining Co Ltd (Yasref), a joint venture of Saudi Aramco (62.5 per cent) and China Petrochemical Corp (Sinopec) (37.5 per cent), has exported the first shipment of petroleum coke (petcoke) from its 400,000-bpd refinery in Yanbu Industrial City on the west coast of Saudi Arabia along the Red Sea. The 49,000-tonne petcoke shipment was based on a fully automated process across production stages through export, Aramco says. The petcoke shipment follows the refinery’s first loading of a 300,000-tonne cargo of high-quality, low-sulphur diesel for export. 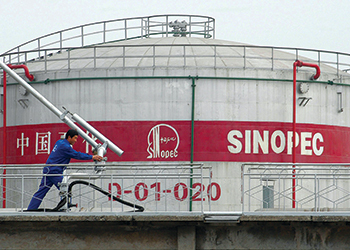 Export of the January diesel cargo marked the official start of the refinery’s commercial operations, including the plants atmospheric and vacuum distillation units, delayed coker, as well as associated utilities, Sinopec says. Initially scheduled for start-up in September 2014 and first commercial shipment of refined products in fourth-quarter 2014, the Yasref refinery now is to reach its full capacity during second-quarter 2015. Most complex refineries typically run only their crude distillation units during startup and so have some residuals to export. This is then followed by starting up secondary units. The long start for Satorp’s secondary units meant lots of residuals production, which had an impact on supplies in the fuel oil market as no one was expecting these volumes. Similarly, some traders are watching for fuel oil from Yasref during its startup. But this will not be the case, according to sources close to the refinery. In contrast to Satorp, the Yasref refinery cannot run its CDU separately from its secondary units since it has no dedicated pipelines, storage or export facilities for fuel oil. This means it will either have to run all the units, or none at all. Yasref is among a swath of new refineries planned by Gulf Cooperation Council states targeting both exports and domestic fuel oil demand for power generation. Aramco also plans to build another 400,000 bpd refinery at Jizan by 2018, although the project has faced several challenges, not least because of its remote location. The UAE’s Abu Dhabi Oil Refining Company, or Takreer, will commission an expansion that will hike the capacity of its Ruwais refinery to 835,000 bpd in early 2015, and it is expected to produce 123,000 bpd of diesel. The expanded refinery is expected to begin production from its new units by the end of the year. These could also be followed by oil products from the planned 615,000 bpd Al Zour refinery in Kuwait and the planned 200,000 bpd Fujairah refinery in the UAE by 2019. Oman is also planning a new 230,000 bpd refinery at Duqm and Bahrain plans to expand its existing Sitra refinery. Assuming all of these projects proceed, by the end of the decade the GCC could have almost 3 mbpd of additional refining capacity in place, on top of around 4.8 mbpd in 2012, according to UK-based Oxford Institute for Energy Studies. The GCC is expected to increase its gasoline production capacity from 650,000 bpd in 2012 to just over 1 mbpd by 2018, while diesel is expected to double from 1.1 mbpd to close to 2 mbpd. Kerosene production capacity will rise by 170,000 bpd and fuel oil will jump 400,000 bpd, according to the Oxford Institute. Some of the oil products from the new refineries will be consumed domestically. The Oxford Institute projected in December that gasoline demand by the six GCC states would rise by 450,000 bpd in 2018 to almost 1 mbpd. Diesel demand too will rise from 940,000 bpd to 1.35 mbpd.